Lately, I've been surprised. For whatever reason, a lot of weelicious moms have been demanding a recipe for rhubarb. With all this sudden reader interest in rhubarb, how is it possible that I never created a recipe using it? Maybe I kept away from it because many rhubarb recipes call for a a good deal of sugar to off set it's mildly tart taste. But after I came across some beautiful rhubarb at our Farmers’ Market last weekend, I decided to take it home and eat some raw to see how it tasted on it's own. In it's natural state, rhubarb actually has an apple-y taste, not too sweet, but oh so good. When paired with fresh sweet strawberries, the need to use so much sugar disappears. Add a crumbly topping of oats, some lemon zest and a touch of brown sugar and rhubarb finds its perfect home. 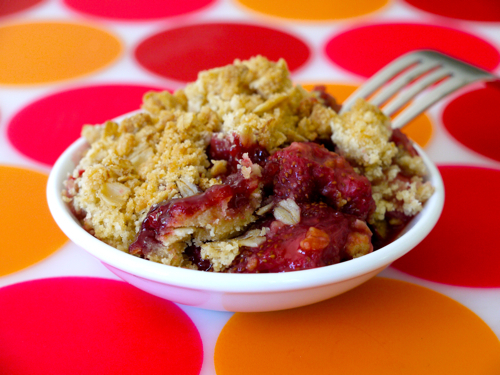 This Strawberry Rhubarb Crumble came out of my oven around 3pm, just in time for the kids to get their midday munch on. I brought it outside for them in little bowls and they sat quietly eating it under the trees on what was a perfect spring day. When my kids are silent it's a good sign they are utterly satisfied, so I knew I hit the jackpot. Of course it wasn't long before they were both screaming for more. If my husband comes through with Mother’s Day breakfast this Sunday, I will definitely be making this again for dessert that night so we can enjoy this special treat together (along with, hopefully, a moment of peace and quiet). 2. Place the first 5 ingredients into a bowl and combine. 3. Add the butter to the dry ingredients and crumble with your hands to form small pea-size clumps. 4. To prepare the filling, toss all the ingredients in a bowl and then place in an oil sprayed 9-inch pie dish or an 8×8 baking dish. 5. Crumble the topping on top of the filling, place dish on a foil lined baking sheet and bake for 40-45 minutes until golden. Sounds delish! Hope to find some rhubarb at my farmers market. Can you use frozen rhubarb? Well, I know what I'm making this weekend! This looks delish and low in sugar - thank you! BTW - this was great! I didn't change the recipe at all and everyone at it up, especially the 1 yo. Thank you again! Looking forward to making this!! my husband is going to LOVE this. rhubarb &amp; strawberry pie is his favorite! will try this weekend! Where can I buy rhubarb? What aisle in the grocery store would it be? Excellent! Looking forward to trying this for my 3yo son (and for me)! I believe rhubarb would be found in the produce section of the grocery store, but I think it's pretty difficult to find unless it's in season (which is Spring). Can't wait to make it, maybe this weekend? Do you think its ok to feed to my 10month old? He has had strawberry's before w/no alergic reaction. Can i make a batch of it and freeze it? I absolutely love Rhubarb!! I can't wait to try this!! I just made this last night and enjoyed it for breakfast with some plain yogurt. Delicious! One tip I picked up from another cookbook is to soak the rhubarb in cold water for 20 minutes before cutting into bite size pieces. I didn't do a control for comparison, but definitely no hint of bitterness in mine! Did the filling part of the recipe get deleted? I don't see it. It had been deleted. :( I added it back in, thanks! This was good- I loved how little sugar you called for :). I did have one question; is it really a full cup of flour in the crumble? It was still pretty \"floury\" after it baked- next time I make it, I think I'll use 3/4c (and there will be a next time!) Thanks for the recipe!